Current data relating to ventilation in ARDS are reviewed. Recent studies suggest that reduced mortality may be achieved by using a strategy which aims at preventing overdistension of lungs. The ventilatory management of patients with acute lung injury (ALI) and acute respiratory distress syndrome (ARDS) has evolved in conjunction with advances in understanding of the underlying pathophysiology. In particular, evidence that mechanical ventilation has an influence on lung injury and patient outcome has emerged over the past three decades.1 The present understanding of optimal ventilatory management is outlined and other methods of respiratory support are reviewed. The pathophysiology of ARDS has been reviewed by Bellingan in an earlier article in this series.2 However, it is useful to highlight important features relevant to ventilatory management, in particular the anatomical distribution of pulmonary pathology and the potential for ventilator induced lung injury. The original description of ARDS included the presence of bilateral infiltrates on the chest radiograph.3 Since the 1980s considerable research has been undertaken using computerised tomographic (CT) scanning which has shown that parenchymal consolidation, far from being evenly distributed, is concentrated in dependent lung regions leaving non-dependent lung relatively spared. This pathological distribution of aerated lung lying over areas of dense consolidation has led to comparisons with ventilation of a much smaller or “baby lung”4 and has important implications for ventilatory management. Thus, the application of normal physiological tidal volumes can lead to overdistension of the small volume of normally aerated lung, while failing to recruit consolidated dependent regions. Ventilatory strategies must therefore be tailored to minimise the risk of inducing or exacerbating further lung injury. Decreased lung compliance is a prominent feature of ARDS. The static compliance of the respiratory system (lung + chest wall) in a ventilated patient is calculated by dividing the tidal volume (Vt) by end inspiratory plateau pressure (Pplat) minus end expiratory pressure + intrinsic PEEP (PEEPi). As the pathology of ARDS is heterogeneous, calculating static compliance does not provide information about regional variations in lung recruitment and varies according to lung volume. Much attention has therefore focused on analysis of the pressure-volume (PV) curve. Schematic representation of a static pressure-volume curve of the respiratory system from a patient with ARDS. Note the lower and upper inflection points of the inspiratory limb. The goals of ventilating patients with ALI/ARDS should be to maintain adequate gas exchange and avoid ventilator induced lung injury. High concentrations of inspired oxygen should be avoided to limit the risk of direct cellular toxicity and to avoid reabsorption atelectasis. Arterial oxygen saturation (Sao2) is used as a target in preference to arterial oxygen tension (Pao2) in recognition of the fact that oxygen delivery is the important determinant of tissue oxygenation. Sao2 values of around 90% are commonly accepted but oxygen delivery decreases quickly below 88% because of the shape of the oxyhaemoglobin dissociation curve. However, if a higher Sao2 can only be obtained by increasing airway pressure to levels that result in haemodynamic compromise, lower Sao2 may have to be accepted. There is no clinical evidence to support the use of specific Fio2 thresholds, but it is common clinical practice to decrease Fio2 below 0.6 as quickly as possible. Oxygenation can be improved by increased alveolar recruitment through the application of higher airway pressure provided that ventilation-perfusion (V/Q) matching is not adversely affected by the haemodynamic consequences of increased intrathoracic pressure. Lung recruitment is usually obtained by applying extrinsic PEEP, increasing the inspiratory:expiratory (I:E) ratio, or by specific recruitment manoeuvres (discussed below). The physiological consequences of hypercapnia are respiratory acidosis, increased cardiac output, and pulmonary hypertension. Neurological changes include increased cerebral blood flow, and cerebral oedema and intracranial haemorrhage have been reported.15 With severe acidosis there may be myocardial depression, arrhythmias, and decreased response to exogenous inotropes. Renal compensation of the respiratory acidosis occurs slowly. Unfortunately there are no data to confirm the degree of respiratory acidosis that is safe. Recent studies (discussed below) have allowed hypercapnia as part of lung protective ventilatory protocols. 1,16–19 Arterial pH was lower in the lung protective groups and the ARDSNet study included the use of sodium bicarbonate to correct arterial pH to normal.1 At present no recommendations can be made concerning the management of respiratory acidosis induced by permissive hypercapnia. However, if bicarbonate is infused, it should be administered slowly to allow CO2 excretion and avoid worsening of intracellular acidosis. One method used to increase CO2 clearance is insufflation of gas into the trachea to flush out dead space CO2 and reduce rebreathing.20 Tracheal gas insufflation has been used both continuously and during expiration only. As no commercially available ventilator includes this technique, modifications are required to the ventilator circuit and settings to prevent inadvertent and potentially dangerous increases in intrinsic PEEP, Vt, and peak airway pressure. In adult patients with ARDS, managed using pressure control ventilation, the introduction of continuous tracheal gas insufflation allowed a decrease in inspiratory pressure of 5 cm H2O without increasing arterial carbon dioxide tension (Paco2).21 Tracheal gas insufflation may therefore be useful when permissive hypercapnia is contraindicated. However, managing the appropriate ventilator settings and adjustment is complicated, with real potential for iatrogenic injury. In practice, Paco2 is allowed to rise during lung protective volume and pressure limited ventilation. Paco2 levels of 2–3 times normal seem to be well tolerated for prolonged periods. Renal compensation for respiratory acidosis occurs over several days. Many clinicians infuse sodium bicarbonate slowly if arterial pH falls below 7.20. Traditional mechanical ventilation (as applied during routine general anaesthesia) involves tidal volumes that are relatively large (10–15 ml/kg) in order to reduce atelectasis. PEEP levels are adjusted to maintain oxygenation but high levels are generally avoided to prevent cardiovascular instability related to increased intrathoracic pressure. Present understanding of ventilator induced lung injury suggests that traditional mechanical ventilation, using high tidal volumes and low PEEP, is likely to enhance lung injury in patients with ARDS. Five randomised studies of “lung protective” ventilation in ARDS have recently been published, four of which investigated limitation of tidal volume to prevent injury from overdistension (table 1). In these studies the protective ventilatory strategy was directed at preventing lung overdistension and was not designed to look at differences in ventilation at low lung volumes. Only the largest study (ARDSNet)1 showed an advantage of such a protective strategy. The ARDSNet study had the largest difference in Vt and Pplat between the groups, the highest power, and was the only study to correct respiratory acidosis (table 2). Others studies have addressed the issue of adjustment of ventilatory support based on PV curve characteristics. Amato et al randomised 53 patients with early ARDS to either traditional ventilation (volume cycled, Vt 12 ml/kg, minimum PEEP guided by Fio2, normal Paco2) or a lung protective strategy (PEEP adjusted to above the lower inflection point of a static PV curve, Vt <6 ml/kg, permissive hypercapnia, and pressure limited ventilatory mode with PIP limited to <40 cm H2O).19 Patients in the lung protective group had improved indices of oxygenation, compliance, and weaning rates. Mortality in the traditional ventilation group was worse at 28 days (71% v 45%, p<0.001) and hospital discharge (71% v 45%, p=0.37). By using the static PV curve to adjust PEEP in the protective ventilation group, this study also addressed the issue of ventilator induced damage by cyclical opening and closure of alveoli. The hospital mortality was lower, but not significantly, in a small group of patients. However, mortality was very high in the traditional ventilation group, making this study difficult to interpret. Further clinical investigation into the role of higher levels of PEEP in combination with recruitment manoeuvres is currently being undertaken by the ARDS Net group. Whatever mode of ventilation is used, it is now clear that tidal volume should be set in the region of 6 ml/kg rather than the traditional 10–12 ml/kg and the peak pressure should be limited to 30–35 cm H2O to prevent lung overdistension—that is, inspiration should be terminated before the upper inflection point on the PV curve. In theory, setting PEEP above the lower inflection point may prevent derecruitment and low lung volume ventilator associated injury. As discussed above, adjusting the level of PEEP to 2 cm H2O above the lower inflection point was part of a lung ventilatory strategy that was advantageous.19 The ARDS Network is currently conducting a randomised trial to identify optimal PEEP. It has been suggested that the effect of PEEP on recruitment in ARDS varies according to the regional distribution of consolidation. In a study employing CT scanning, patients were divided into groups according to the distribution of consolidation (lobar, diffuse, or patchy CT attenuations).26 PEEP had little effect on lobar consolidation but induced the greatest reduction in non-aerated lung in patients with diffuse CT abnormalities. Current clinical practice in the absence of routine static PV curve measurement is to set PEEP at a relatively high level such as 15 cm H2O in patients with ARDS. Prolongation of the inspiratory time with an increased I:E ratio is commonly used as a method of recruitment. Mean airway pressure is increased. Shortening of expiratory time can cause hyperinflation and the generation of intrinsic PEEP (PEEPi). Providing that ventilation is pressure limited, PEEPi can be manipulated to increase recruitment further. In volume control modes of ventilation without pressure limitation, PEEPi levels can increase to dangerous levels causing lung overdistension and haemodynamic compromise. No clinical outcome studies have specifically addressed inspiratory time or levels of PEEPi. It is common practice during pressure control ventilation to increase the I:E ratio to 1:1 or 2:1 (inverse ratio ventilation) with close monitoring of PEEPi and haemodynamics. There has been renewed interest recently in manoeuvres aimed at increasing alveolar recruitment following the recognition that higher levels of PEEP are necessary to sustain any benefit obtained by such manoeuvres, and that any sudden reduction such as ventilator disconnection for suctioning leads to derecruitment. The sigh function involves the delivery of intermittent breaths of larger tidal volume, administered either via the mechanical ventilators or by hand. Sighs delivered to patients with ARDS increase alveolar recruitment but the benefit is short lived, lasting less than 30 minutes.27 The same authors also suggest that secondary ARDS (ARDS as a result of non-pulmonary disease) is more responsive to sighs than primary ARDS. Sustained inflation or continuous positive airway pressure (CPAP) is another form of recruitment manoeuvre. Several investigators have reported the effects of different manoeuvres in patients with ARDS (table 3). Recruitment manoeuvres may be more effective in patients ventilated with relatively low levels of PEEP. Conversely, they may be less effective and cause lung overdistension in patients with already optimally recruited lungs—that is, with higher levels of PEEP. Recruitment manoeuvres all involve increasing intrathoracic pressure and therefore the risk of barotrauma and cardiovascular instability. At present there are no published data from randomised studies to indicate whether recruitment manoeuvres, of whatever form, influence outcome. Two modes of ventilation commonly available on mechanical ventilators—biphasic airway pressure (BiPAP) and airway pressure release ventilation (APRV)—allow spontaneous breathing to occur at any stage of the respiratory cycle. In these modes the ventilator cycles between an upper and lower pressure at preset time intervals. Spontaneous breathing during mechanical ventilation decreases intrathoracic pressure and improves V/Q matching and cardiac output.28 These theoretical benefits have resulted in more widespread use of the BiPAP mode, which provides a range of I:E ratios (APRV applies a very short expiratory time), but again no data exist concerning any influence on outcome. Prone position was reported to improve oxygenation in patients with ARDS as long ago as 1976.29 The mechanism of the improvement in oxygenation on turning prone, seen in about two thirds of patients with ARDS, is complex. The intuitive explanation that regional lung perfusion is primarily dependent on gravity leading to improved perfusion of non-consolidated lung on turning is not substantiated by research. In fact, perfusion to dorsal lung regions predominates whatever the patient’s position,30 and gravity accounts for less than half the perfusion heterogeneity seen in either the supine or prone position.31 Changes in regional pleural pressure are more important. The gradient of pleural pressure from negative ventrally to positive dorsally in the supine position is not completely reversed on turning prone, so that the distribution of positive pressure ventilation is more homogenous in the prone position.32 Thus, recruitment of dorsal lung appears to be the predominant mechanism of improved oxygenation. Potential problems of prone positioning are increased venous pressure in the head (facial oedema), eye damage (corneal abrasions, retinal and optic nerve ischaemia), dislodgment of endotracheal tubes and intravascular catheters, and increased intra-abdominal pressure. A multicentre prospective randomised study of the prone position for adult patients with ARDS has recently been completed in Italy.33 Patients randomised to prone positioning were assessed daily for the first 10 days and turned prone for at least 6 hours if severity criteria were met. There were no differences in clinical outcome. Prone positioning is a useful adjunct to ventilation and may help to improve oxygenation and pulmonary mechanics but, as yet, has not been shown to alter outcome in ARDS. There has been a resurgence of interest in high frequency ventilation (HFV, rate >60/min) over the last few years. Initial enthusiasm had been tempered by practical difficulties and the lack of clinical outcome data showing any advantage over conventional mechanical ventilation. The recent clinical studies of conventional ventilation demonstrating the advantages of limited Vt and maintenance of lung volume have helped to promote interest in HFV. The very low Vt (1–5 ml/kg) provided by HFV offers the possibility of maintaining lung volume at a higher point on the PV curve with less risk of causing overdistension.34 High frequency jet ventilation (HFJV) and high frequency oscillatory ventilation (HFOV) have been the two most commonly used methods used to ventilate patients in the intensive care unit. High frequency jet ventilation uses a high pressure gas jet delivered into an endotracheal tube at high frequency (100–200 Hz). Other gas in the ventilator circuit is entrained producing a Vt of 2–5 ml/kg that can be adjusted by altering the inspiratory time and/or driving pressure. During HFJV, expiration occurs passively. Practical problems encountered are inadequate humidification, potential for gas trapping, difficulty in adjusting ventilator settings, and the need for a specialised endotracheal tube. High frequency oscillatory ventilation differs from HFV in a number of important aspects. Tidal volume (1–3 ml/kg) is generated by the excursion of an oscillator within a ventilator circuit similar to that used for CPAP and is varied by altering the frequency, I:E ratio, and oscillator amplitude. The use of an oscillator to generate Vt results in active expiration. Mean airway pressure is adjusted by altering the fresh gas flow (bias flow) into the circuit or the expiratory pressure valve. Oxygenation is controlled by altering mean airway pressure or Fio2. HFOV has been used extensively in neonates, and studies suggest that it is associated with a lower incidence of chronic lung disease than conventional ventilation.39 HFOV (with a recruitment protocol) was compared with conventional mechanical ventilation in 70 paediatric patients with respiratory failure secondary to diffuse alveolar disease or large air leaks using a crossover (for treatment failure) study design.40 Overall outcomes were similar with the exception that patients randomised to HFOV had a lower requirement for supplemental oxygen at 30 days. After subgroup analysis, mortality was lower in patients treated with HFOV than in those treated with conventional mechanical ventilation only (6% v 40%). There are few data on the use of HFOV in adult patients. In an observational study of 17 patients with ARDS, HFOV was reported to be effective and safe.41 A multicentre prospective randomised study of HFOV compared with conventional mechanical ventilation is currently underway (Multicenter Oscillator ARDS Trial (MOAT 2)). ARDS is associated with loss of surfactant, a consequent rise in surface tension, and alveolar collapse. Filling the lung with liquid removes the air-liquid interface and supports alveoli, thus preventing collapse. Perfluorocarbons have been used in this approach because they have low surface tension and dissolve oxygen and carbon dioxide readily. The use of inhaled vasodilators in patients with ALI/ARDS will be described in a later article in this series by Cranshaw et al44 and will not be discussed further here. ECMO has proven mortality benefit in neonatal ARDS. In adults a single prospective randomised study failed to show a survival advantage over conventional support.46 However, overall survival in both groups was extremely low and the results are not applicable to current practice. Extracorporeal CO2 removal (ECCOR) involves use of an extracorporeal veno-venous circuit with lower blood flows and oxygenation still occurring via the patient’s lungs. A randomised prospective study of ECCOR compared with conventional support in patients with severe ARDS reported no significant difference in survival.47 Several centres have recently reported observational studies showing high survival rates in adult patients managed with extracorporeal support (table 4). These encouraging survival rates should be interpreted, however, in the context of improved survival without ECMO.48,49 A randomised prospective controlled study of ECMO in adult patients is currently underway in Leicester, UK. The current data relating to conventional ventilation in ARDS suggest that high tidal volumes (12 ml/kg) with high plateau pressure (more than 30–35 cm H2O) are deleterious and that a strategy aimed at preventing overdistension by decreasing tidal volume to 6 ml/kg and limiting plateau pressure to <30 cm H2O is associated with lower mortality.50 In addition, ventilation directed at preventing cyclical opening and closing of alveoli by adjusting PEEP according to the PV curve to maintain recruitment may have a role in preventing lung injury and further studies are underway to clarify this issue. There may also be a role for recruitment manoeuvres, particularly after episodes of derecruitment. High frequency ventilation, including a recruitment protocol, may offer the ultimate lung protective ventilation, but further clinical studies are required. Acute Respiratory Distress Syndrome Network (ARDSNet). Ventilation with lower tidal volumes as compared with traditional tidal volumes for acute lung injury and the acute respiratory distress syndrome. N Engl J Med2000;342:1301–8. Bellingan GJ. The pulmonary physician in critical care · 6: The pathogenesis of ALI/ARDS. Thorax2002;57:540–6. Ashbaugh DG, Bigelow DB, Petty T, et al. Acute respiratory distress in adults. Lancet1967;ii:319–23. Gattinoni L, Pesenti A, Avalli L, et al. Pressure-volume curve of total respiratory system in acute respiratory failure. Computed tomographic scan study. Am Rev Respir Dis1987;136:730–6. Whitehead T, Slutsky AS. The pulmonary physician in critical care · 7: Ventilator induced lung injury. Thorax2002;57:635–42. Singer MM, Wright F, Stanley LK, et al. Oxygen toxicity in man. A prospective study in patients after open-heart surgery. N Engl J Med1970;283:1473–8. Dreyfuss D, Sauman G. Ventilator-induced lung injury: lessons from experimental studies. Am J Respir Crit Care Med1998;157:294–323. Muscedere JG, Mullen JB, Gan K, et al. Tidal ventilation at low airway pressures can augment lung injury. Am J Respir Crit Care Med1994;149:1327–34. Ranieri VM, Suter PM, Tortorella C, et al. Effect of mechanical ventilation on inflammatory mediators in patients with acute respiratory distress syndrome: a randomised controlled trial. JAMA1999;282:54–61. 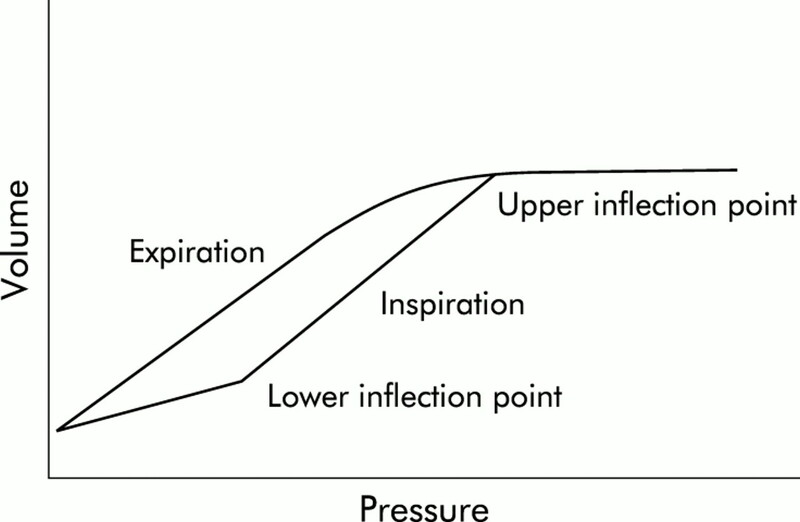 Brochard L. Respiratory pressure-volume curves. In: Tobin MJ, ed. Principles and practice of intensive care monitoring. New York: McGraw-Hill, 1998: 597–616. Harris RS, Hess DR, Venegas JG. An objective analysis of the pressure-volume curve in the acute respiratory distress syndrome. Am J Respir Crit Care Med2000;161:432–9. Hall JB. Respiratory system mechanics in adult respiratory distress syndrome. Stretching our understanding. Am J Respir Crit Care Med1998;158:1–2. Ranieri VM, Zhang H, Mascia L, et al. Pressure-time curve predicts minimally injurious ventilatory strategy in an isolated rat lung model. Anesthesiology2000;93:1320–8. Hickling KG, Henderson SJ, Jackson R. Low mortality associated with low volume pressure limited ventilation with permissive hypercapnia in severe adult respiratory distress syndrome. Intensive Care Med1990;16:372–7. Rodrigo C, Rodrigo G. Subarachnoid haemorrhage following permissive hypercapnia in a patient with severe acute asthma. Am J Emerg Med1999;17:697–9. Stewart TE, Meade MO, Cook DJ, et al. Evaluation of a ventilation strategy to prevent barotrauma in patients at high risk for acute respiratory distress syndrome. N Engl J Med1998;338:355–61. Brochard L, Roudot-Thoraval F, Roupie E, et al. Tidal volume reduction for prevention of ventilator-induced lung injury in acute respiratory distress syndrome. Am J Respir Crit Care Med1998;158:1831–8. Brower RG, Shanholtz CB, Fessler HE, et al. Prospective, randomised, controlled clinical trial comparing traditional versus reduced tidal volume ventilation in acute respiratory distress syndrome patients. Crit Care Med1999;27:1492–8. Amato MBP, Barbas CSV, Medeiros DM, et al. Effect of a protective-ventilation strategy on mortality in the acute respiratory distress syndrome. N Engl J Med1998;338:347–54. Nahum A, Ravenscraft SA, Nakos G, et al. Tracheal gas insufflation during pressure-control ventilation. Effect of catheter position, diameter, and flow rate. Am Rev Respir Dis1992;146:965–73. Hoffman LA, Miro AM, Tasota FJ, et al. Tracheal gas insufflation. Limits of efficacy in adults with acute respiratory distress syndrome. Am J Respir Crit Care Med2000;162:387–92. Rappaport SH, Shpiner R, Yoshihara G, et al. Randomized, prospective trial of pressure-limited versus volume-controlled ventilation in severe respiratory failure. Crit Care Med1994;22:22–32. Lessard MR, Guerot E, Lorino H, et al. Effects of pressure-controlled ventilation on respiratory mechanics, gas exchange and haemodynamics in patients with adult respiratory distress syndrome. Anesthesiology1994;80:983–91. Esteban A, Alia I, Gordo F, et al. Prospective randomised trial comparing pressure-controlled ventilation and volume-controlled ventilation in ARDS. Spanish Lung Failure Collaborative Group. Chest2000;117:1690–6. Ranieri VM, Eissa NT, Corbeil et al. Effects of positive end-expiratory pressure on alveolar recruitment and gas exchange in patients with the adult respiratory distress syndrome. Am Rev Respir Dis1991;144:544–51. Puybasset L, Gusman P, Muller JC, et al. Regional distribution of gas and tissue in acute respiratory distress syndrome. III. Consequences for the effects of positive end-expiratory pressure. CT Scan ARDS Study Group. Adult Respiratory Distress Syndrome. Intensive Care Med2000;26:1215–27. Pelosi P, Cadringher P, Bottino N, et al. Sigh in acute respiratory distress syndrome. Am J Respir Crit Care Med1999;159:872–80. Putensen C, Mutz NJ, Putensen-Himmer G, et al. Spontaneous breathing during ventilatory support improves ventilation-perfusion distributions in patients with acute respiratory distress syndrome. Am J Respir Crit Care Med1999;159:1241–8. Piehl MA, Brown RS. Use of extreme position changes in respiratory failure. Crit Care Med1976;4:13–4. Glenny RW, Lamm WJ, Albert RK, et al. Gravity is a minor determinant of pulmonary blood flow distribution. J Appl Physiol1991;71:620–9. Jones AT, Hansell DM, Evans TW. Pulmonary perfusion in supine and prone positions: an electron-beam computed tomography study. J Appl Physiol2001;90:1342–8. Lamm WJ, Graham MM, Albert RK. Mechanism by which the prone position improves oxygenation in acute lung injury. Am J Respir Crit Care Med1994;150:184–93. Gattinoni L, Tognoni G, Pesenti A, et al. Effect of prone positioning on the survival of patients with acute respiratory failure. N Engl J Med2001;345:568–73. Froese AB, McCullough PR, Siguria M, et al. Optimizing alveolar expansion prolongs the effectiveness of exogenous surfactant therapy in the adult rabbit. Am Rev Respir Dis1993;148:569–77. Carlon GC, Howland WS, Ray C, et al. High frequency jet ventilation: a prospective, randomised evaluation. Chest1983;84:551–9. Hurst JM, Branson RD, Davis K, et al. Comparison of conventional mechanical ventilation and high-frequency ventilation: a prospective randomised trial in patients with respiratory failure. Ann Surg1990;211:486–91. Herridge MS, Slutsky AS, Colditz GA. Has high-frequency ventilation been inappropriately discarded in adult acute respiratory distress syndrome? Crit Care Med1998;26:2073–7. Froese AB. High-frequency oscillatory ventilation for adult respiratory distress syndrome: let’s get it right this time. Crit Care Med1997;25:906–8. Riphagen S, Bohn D. High frequency oscillatory ventilation. Intensive Care Med1999;25:1459–62. Arnold JH, Hanson JH, Toro-Figuero LO, et al. Prospective, randomised comparison of high-frequency oscillatory ventilation and conventional mechanical ventilation in pediatric respiratory failure. Crit Care Med1994;22:1530–9. Fort P, Farmer C, Westerman J, et al. High-frequency oscillatory ventilation for adult respiratory distress syndrome: a pilot study. Crit Care Med1997;25:937–47. Hirschl RB, Conrad S, Kaiser R, et al. Partial liquid ventilation in adult patients with ARDS: a multicenter phase I-II trail. Ann Surg1998;228:692–700. Leonard RC. Liquid ventilation. Anaesth Int Care1998;26:11–21. Cranshaw J, Griffiths MJD, Evans TW. The pulmonary physician in critical care · 9: Non-ventilatory strategies in ARDS. Thorax2002;57 (in press). Reng M, Philipp A, Kaiser M, et al. Pumpless extracorporeal lung assist and adult respiratory distress syndrome. Lancet2000;356:219–20. Zapol WM, Snider MT, Hill JD, et al. Extracorporeal membrane oxygenation in severe acute respiratory failure. A randomised prospective study. JAMA1979;242:2193–6. Morris AH, Wallace CJ, Menlove RL, et al. Randomized clinical trial of pressure-controlled inverse ratio ventilation and extracorporeal CO2 removal for adult respiratory distress syndrome. Am J Respir Crit Care Med1994;149:295–305. Abel SJ, Finney SJ, Brett SJ, et al. Reduced mortality in association with the acute respiratory distress syndrome (ARDS). Thorax1998;53:292–4. Millberg JA, Davis DR, Steinberg KP, et al. Improved survival of patients with acute respiratory distress syndrome (ARDS): 1983–1993. JAMA1995;273:306–9. International consensus conferences in intensive care medicine. Ventilator-associated lung injury in ARDS. Intensive Care Med1999;25:1444–52. Lapinsky SE, Aubin M, Mehta S, et al. Safety and efficacy of a sustained inflation for alveolar recruitment in adults with respiratory failure. Intensive Care Med1999;25:1297–301. Medoff BD, Harris RS, Kesselman H, et al. Use of recruitment maneuvers and high-positive end-expiratory pressure in a patient with acute respiratory distress syndrome. Crit Care Med2000;28:1210–6. Lewandowski K, Rossaint R, Pappert D, et al. High survival rate in 122 patients managed according to a clinical algorithm including extra-corporeal membrane oxygenation. Intensive Care Med1997;23:819–35. Ullrich R, Larber C, Roder G, et al. Controlled airway pressure therapy, nitric oxide inhalation, prone position, and ECMO as components of an integrated approach to ARDS. Anesthesiology1999;91:1577–86. Bartlett RH, Roloff DW, Custer JR, et al. Extracorporeal life support. The University of Michigan Experience. JAMA2000;283:904–8. Linden V, Palmer K, Reinhard J, et al. High survival in adult patients with acute respiratory syndrome treated by extracorporeal membrane oxygenation, minimal sedation, and pressure supported ventilation. Intensive Care Med2000;26:1630–7.